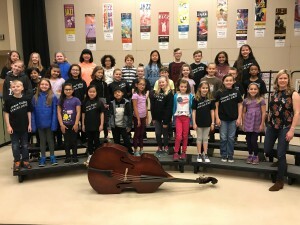 Jazz Bassist and Vocalist, Kristin Korb visited Grass Valley Jazz Choir students on Thursday, April 12, 2018. Grass Valley students had the opportunity to listen and watch Kristin during their monthly assembly in the cafeteria. She commented how delightful and engaging her audience was! Thank you, Kristin Korb, for sharing your talents with Grass Valley students and staff!